© Posted on January 29, 2018, by Michael E. Newton. With money given to him by his cousin, Alexander Hamilton came to mainland North America to pursue a higher education. Before going to college, Hamilton first enrolled in Francis Barber’s grammar school in Elizabethtown, New Jersey. Attending this school from October 1772 until he started college in September 1773, Hamilton boarded with William Livingston in an Elizabethtown house rented from Jacob De Hart just a short walk from the school. According to John C. Hamilton, Alexander Hamilton studied at the grammar school alongside “Jonathan Dayton, afterwards speaker of the House of Representatives; Brockholst Livingston, subsequently a judge of the Supreme Court of the United States, and others who became of note.” Was John C. Hamilton correct about Jonathan Dayton and Brockholst Livingston attending school with Alexander Hamilton? Can anyone else be identified as Alexander Hamilton’s classmate in Elizabethtown? 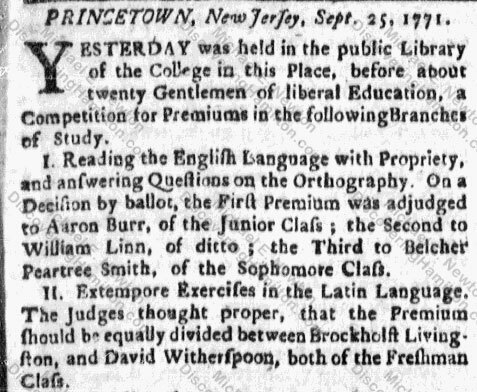 Thus, Brockholst Livingston could not have attended the grammar school in Elizabethtown with Alexander Hamilton since he was studying at the College of New Jersey in Princeton at the time. However, it is likely that Brockholst visited his family during breaks and that Hamilton and Brockholst Livingston met during Hamilton’s time living in Elizabethtown. Jonathan Dayton, the son of Elias Dayton of Elizabethtown, may or may not have been Hamilton’s classmate at the grammar school in Elizabethtown, as John C. Hamilton claimed. Jonathan Dayton graduated from the College of New Jersey in 1776. If he attended college for the normal four years, and there is no evidence to suggest otherwise, he would have already left for college by the time Hamilton arrived in Elizabethtown. It is possible, however, that Dayton did not enter the College of New Jersey until September 1773 and graduated after just three years. 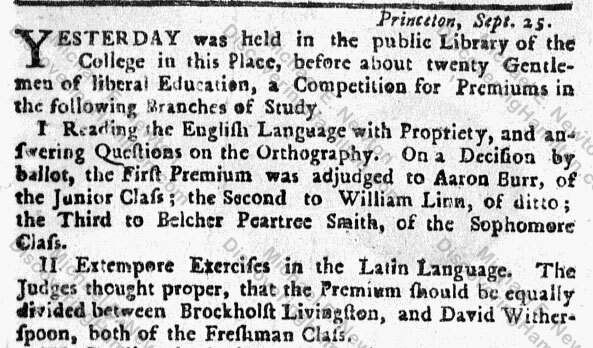 Although the college generally prohibited pupils from studying at an advanced pace, they may have granted early diplomas in 1776 to students who were entering the army, as Jonathan Dayton did. Like with Brockholst Livingston, even if Jonathan Dayton did not attend the grammar school at the same time as Hamilton, Hamilton surely would have met him whenever he came to town to visit his family and friends. There is one youth who definitely attended the grammar school in Elizabethtown alongside Alexander Hamilton. On May 5, 1773, Francis Barber billed “Mastr John Livingston,” the son of William Livingston, £1 5s for “1 quarters instruction” and another 7s 6d for “wood & cash for house cleaning.” The total of £1 12s 6d was received in full by Francis Barber on May 12. Another receipt shows that Francis Barber billed “Mastr John L. Livingston” £1 5s on August 5, 1773, for “1 quarters instruction,” which was paid on August 21. Thus, for the two quarters ending in May and August, Alexander Hamilton and John Lawrence Livingston were classmates at Francis Barber’s grammar school in Elizabethtown. It is possible that John Lawrence Livingston’s attendance at this school lasted more than just these two quarters, but no record of this remains. If so, perhaps John Lawrence Livingston was Hamilton’s classmate during the entirety of Hamilton’s attendance at the grammar school of Elizabethtown. N.B. It is possible that John C. Hamilton or whoever was his source had misheard or misremembered that it was John Lawrence Livingston and not his brother Henry Brockholst Livingston who attended the grammar school of Elizabethtown with Alexander Hamilton. Alexander Hamilton and John Lawrence Livingston were more than just schoolmates. During his stay in Elizabethtown, Alexander Hamilton lived with the Livingston family. Thus, Alexander Hamilton and John Lawrence Livingston must have frequently walked together the six-tenths of a mile to and from school. John Lawrence Livingston was born in July 1762, making him five and a half years younger than Hamilton. In the spring of 1780, New Jersey Governor William Livingston obtained for his son John Lawrence an appointment as midshipman in the navy. In March 1781, the Saratoga with John Lawrence Livingston aboard was chasing another ship when the wind became “so exceeding violent” that the ship was “with great probability supposed to have been lost.” For years, William Livingston hoped that his son was still alive, perhaps having been taken to Algiers, but “no reliable news was ever received” regarding the Saratoga or John Lawrence Livingston. John C. Hamilton, History of the Republic 1:45. See also John C. Hamilton, The Life of Alexander Hamilton 1:8. General Catalogue of Princeton University 97. General Catalogue of Princeton University 99. 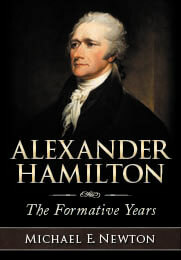 John C. Hamilton, History of the Republic 1:45; John C. Hamilton, The Life of Alexander Hamilton 1:8. The New York Genealogical and Biographical Record 41:307; The Correspondence and Public Papers of John Jay 3:384.